Keeping pace with the times, the web hosting industry has recently joined the environmental movement and has “gone green”. While on the surface this may seem a little confusing—as in how can a service be green—the core of the technologies at play here do require lots of energy. As such, making the environmentally friendly move to green web hosting not only helps preserve our resources and reduce our carbon footprints, it also shows your customers the type of eco-friendly company you are. This helps to improve customer relations and serves to increase sales. Green web hosting happens when a service provider changes the way that they power their data center. By switching to renewable energy sources such as solar power, hydro power or wind energy, service centers are able to reduce their carbon footprint. Additionally, many web hosting service providers that offer green web hosting plans also participate in carbon offsetting. Carbon offsetting is the company’s participation in actions that offset the carbon footprint they are leaving on the planet. For the most part, this includes things such as waste recycling, minimizing their disposable waste production and output or planting trees around the community in which they are located. Some web hosting service sites choose to become a Green-E site. That means that they voluntarily adhere to a set of strict environmental guidelines and practices. These service providers don’t directly have to use green power that comes from renewable sources such as wind, water or the sun. Rather, they can simply purchase the green certificates to help them offset the costs that are associated with using conventional energy sources. Other green web hosting companies consolidate their data in order to prevent system overload that can cause more energy to be needed. 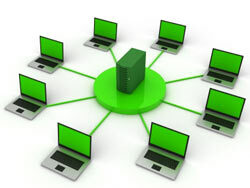 Other methods of green web hosting include using lower voltage computer equipment, conducting online meetings, donating to green organizations and using energy efficient appliances in and around the work space. All in all, the green web hosting movement aims to reduce the amount of energy they use while adhering to a set of strict environmental guidelines. This can be achieved by either carbon reduction, carbon offsetting or a combination of both. Where Does the Need for Green Web Hosting Come From? One of the biggest reasons that green web hosting has become such a popular option for web hosting service providers to turn to is the energy consumption problem facing the world. The global energy consumption rate from the Internet alone is $7.2 billion. With $2.7 billion of that coming from the United States, the US is leading the green web hosting charge, hoping to set a precedent felt around the world. Plus, with the Internet growing from 400% to 1000% each year around the world, it is estimated that without changing our current practices, the web hosting industry will be putting out more pollution each year than the airline industry. Additionally, the average server puts out the same amount of carbon emissions as a 15 mile per gallon SUV. It is clear that a solution had to be implemented and that solution is green web hosting. As you can see, by reducing the amount of non-renewable energy sources used, offsetting their carbon output and reducing waste, web hosting service providers are helping to preserve our planet’s precious resources. When you join a green web hosting plan, you’re doing your part to conserve by going green. Green web hosting saves money on energy for web hosting companies. These savings can be directly passed onto you through lower plan prices. Some green web hosting plans come with tax write-offs. That means that by simply using green web hosting services, you can get a tax break. Customers appreciate the effort your company or website is making to go green. By displaying “Green Badges” on your website, you’ll be able to appeal to eco-conscious customers and build your reputation as an environmentally responsible company. That last one appeals to a fairly large market as the green movement has really taken off over the past few years. This can be particularly helpful for companies that are trying to reduce their own carbon footprint. By choosing a green web hosting plan, a high-polluting industry—say an automobile dealership, for example—can help offset the image that eco-friendly customers might have in their minds. Essentially, it’s just good PR for companies to have green web hosting verification badges displayed on their websites. This guest article has been written by Andrew Shapiro from Website Host Critic, a premier web host review site featuring popular web host reviews including FatCow reviews. If you’re looking to save time searching hours online for a good web host, check out their GreenGeeks review among the other highly recommended hosts at their website today. This entry was posted on Friday, August 23rd, 2013 at 5:43 pm and modified by WebMaster View on Tuesday, July 8th, 2014 at 12:17 am. You can follow any responses to this entry through the RSS 2.0 feed. Responses are currently closed, but you can trackback from your own site.